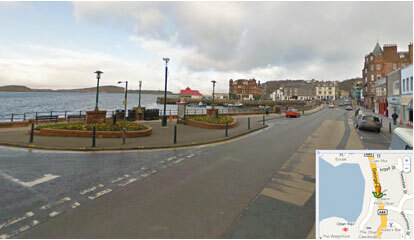 The Palace Hotel is situated on Oban’s main street which is the main road from Glasgow, Perth etc. There are two sets of traffic lights on George Street, the door to the hotel is just before the second set, next to the Royal Bank of Scotland. No residential Parking available. For customers arriving by bus, train or ferry, please walk along the water front with the water to your left. The hotel is opposite the bay located between the railway and north piers approximately 2 minutes walk from the stations. On street parking is available. (Chargeable from 9am till 6pm current price £0.80 for 40 minutes maximum stay during this time 2 hours) 6pm till 9am no restrictions. Unfortunately we do not have any private parking.